Shades of green, grey and white stand out amongst the rustic details of this next table. 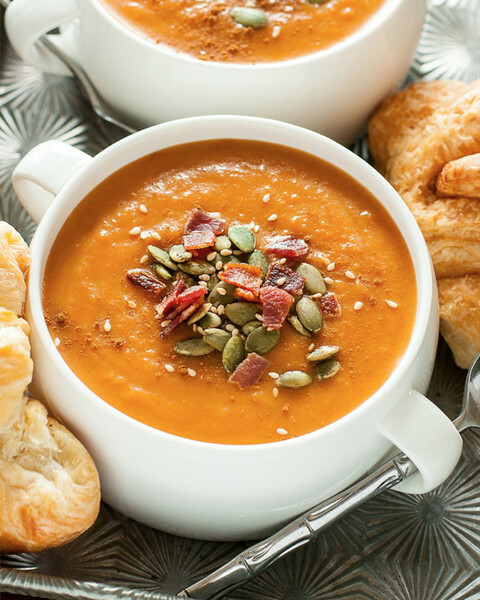 Top it all off with soft candle light and you’re ready for a holiday feast! 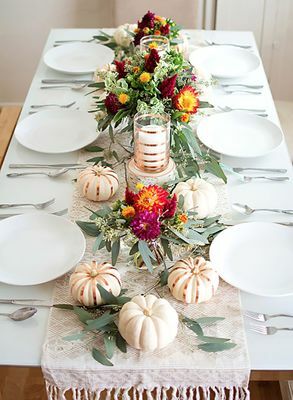 Check out the rest of this enchanted autumn table from White Buffalo Styling Co.
Are you ready for the holidays? 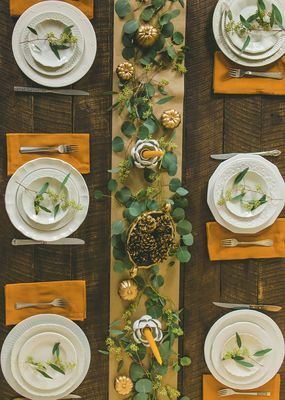 They're starting to sneak up on us, so we've rounded up some beautiful tablescapes to inspire and help you create a warm and inviting holiday table this Thanksgiving for your friends and family to enjoy. Whether you're more traditional, minimalist or modern, we have a few ideas that will really transform your table into a stylish and comfortable space. 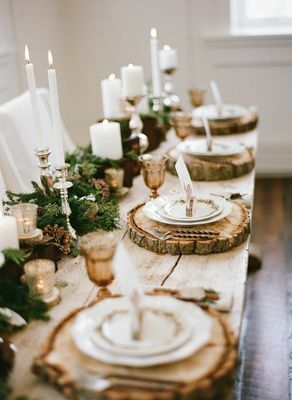 Large wood sliced chargers add a rustic touch to our first holiday table, and this extra festive look from Jennifer Collier can be easily transformed for all your holiday entertaining. 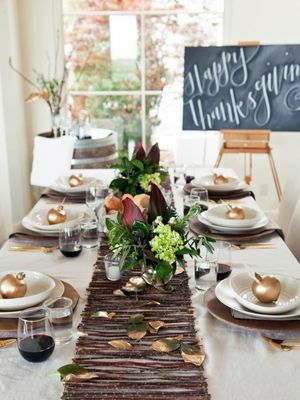 Try something different with this modern organic thanksgiving table. The mix of textures and greenery help create a cozy vibe without going overboard on the decor. Simple, practical and unique, check out the entire look from Craft and Couture. 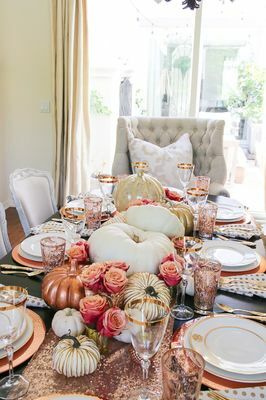 Mismatched tableware, gold pumpkins and a fun kraft paper table runner finish off this must-have design that's easy on the eyes and wallet from The Kitchn. 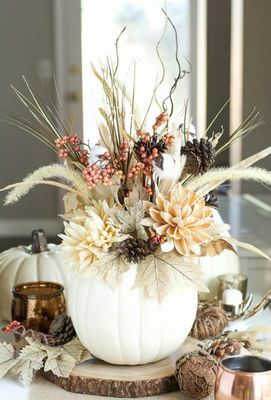 If you're in a pinch, keep it simple and chic with this beginners centerpiece from Julie Blanner. 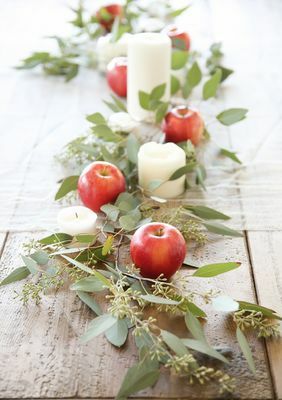 Apples, seeded eucalyptus and white pillar candles are all you need to recreate this stylish look. 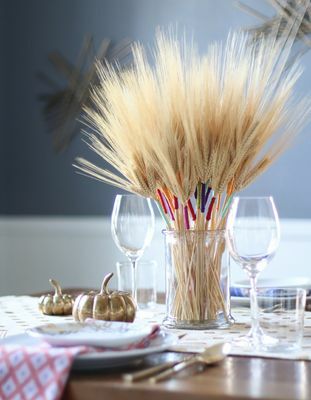 These color wrapped stalks of wheat add an instant splash of color on your Thanksgiving table, and you can learn how to DIY them for yourself from Inspired By Charm. Bright colors and pops of metallic give this modern tablescape a welcoming vibe. The well-thought design from Homey Oh My also has a cute DIY place card holder you see here. 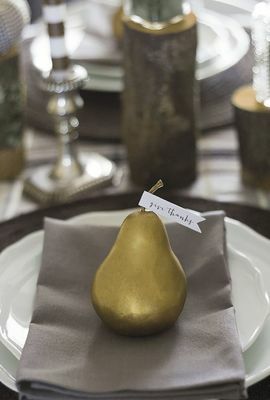 If you wanted to give your guests something other than leftovers to take home, these cute gold pears with paper flags from Mountain Modern Life make a quick and easy DIY favor. Metallic tones are trending and they are an easy addition to your holiday table. 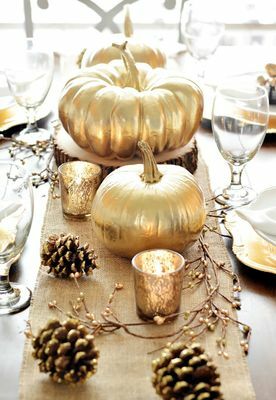 Spray paint your pumpkins and pinecones gold for a warm and dramatic must-have look from A Pumpkin & A Princess. Neutrals are a great addition to your table because they go with damn near everything! 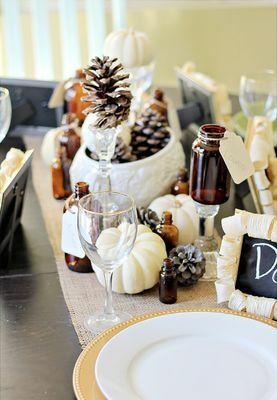 Craftberry Bush added pumpkins, squash, pinecones and dusty miller to their chic centerpiece. Our favorite detail? The vintage music sheet placemats! Create your very own fall farmhouse table with this beautiful design from Rooms For Rent. Muted colors and copper + gold accents create a warm and inviting space that’s sure to give you all the feels this holiday season. 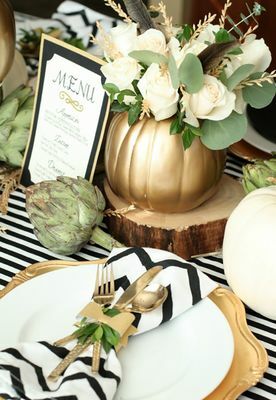 This hip and stylish Thanksgiving table pairs metallic gold pumpkins with modern black and white striped linens. 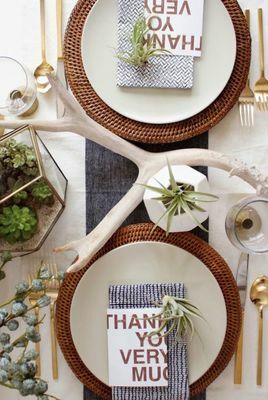 Topped off with natural elements of antlers and feathers, it’s a modern, rustic tablescape that is a must-see from Giggle Galore. 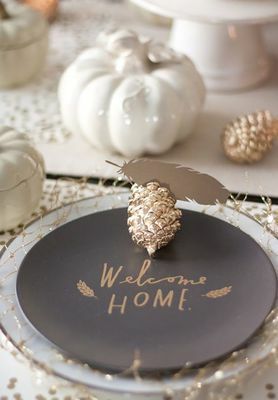 Help your guests find their seats with these gold pinecone place card holders. With a little spray paint, this is an easy DIY your guests will rave about. See the entire design here from Just Destiny. 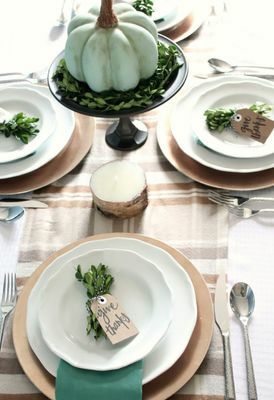 Speaking of place cards, these mini white pumpkins are an adorable addition to your holiday table. Add on a custom leaf tag for a take home favor your guests will love from Ella Claire Inspired. Candlesticks, all in a row make a pretty centerpiece for your holiday table. Our favorite detail? 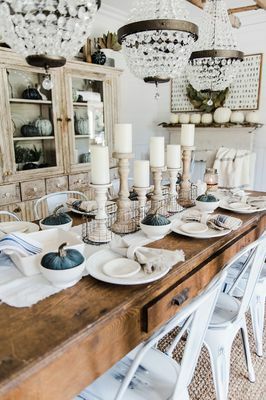 Well, the stunning chandelier of course (we know it’s not on the table, but we can’t stop staring) from Liz Marie Blog. These mini pumpkins have been transformed into a rainbow of fall colors for one unique centerpiece from Casa De Perrin. 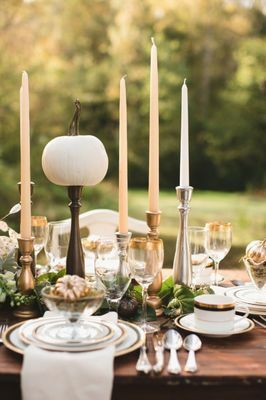 Natural elements of sticks, pinecones, feathers and rosemary sprigs carry out the autumn theme of this next tablescape from Home Stories beautifully. 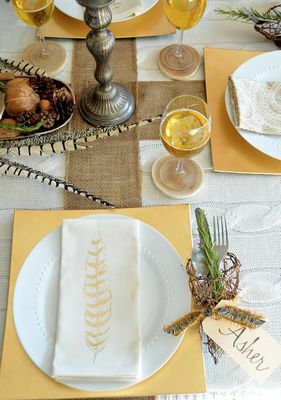 The variation of textures gives the neutral color palette depth, and we especially love the metallic gold feather napkins! Gold pomegranate place card holders and a stunning twig table runner set the tone for this next table. 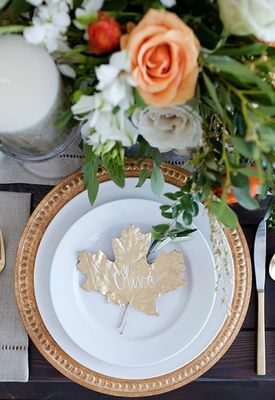 The gold dipped leaves are the perfect homage to fall for a simple yet elegant look from HGTV. 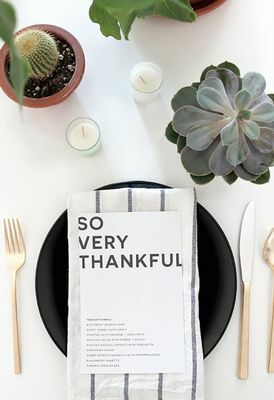 Customizable and totally free, this fun modern menu would look amazing on your Thanksgiving table from Almost Makes Perfect. Make your very own fall themed centerpiece with this awesome DIY pumpkin vase here from A Pumpkin & A Princess. 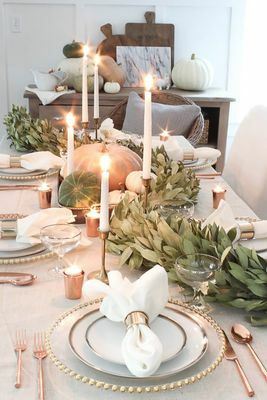 Warm tones of gold, copper, cream and blush create one dreamy tablescape while the copper sequin table runner adds an unexpected hint of glam from Randi Garrett Design. 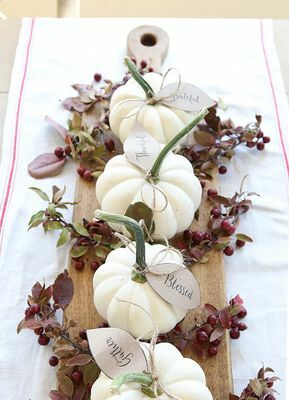 This cute place card is a great way to make use of those fall leaves that are just laying around, so don’t rake them up just yet! Check out the rest of the design here for more ideas from Little Peanut. Unless you live somewhere warm, you probably won’t be eating outside this Thanksgiving. 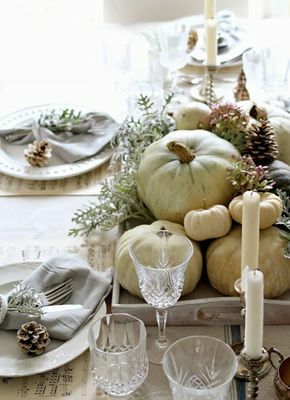 However, this tablescape is GORGEOUS with it’s neutral color palette and rich textures. See all the details up close from JOPhoto here. This sleek and modern table uses organic greenery (check out that garland wall!) and white linens for an oh-so-fresh look and feel from Homey Oh My. This next tablescape from Domestically Speaking added a unique decor item we have yet to see - vintage glass bottles with tags! Learn how to recreate it here. 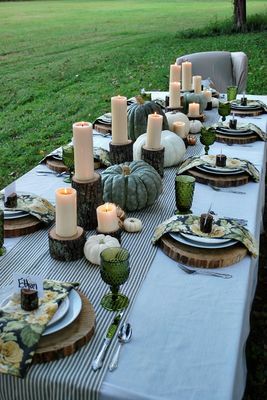 If you have a smaller table this year, don’t fret! 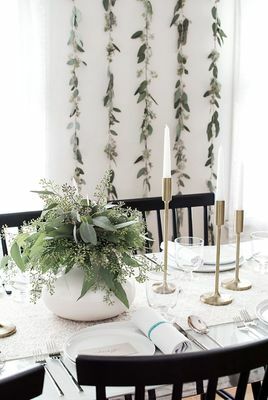 This adorable tablescape from Lady and Laura Kate uses minimal decor with hints of color. 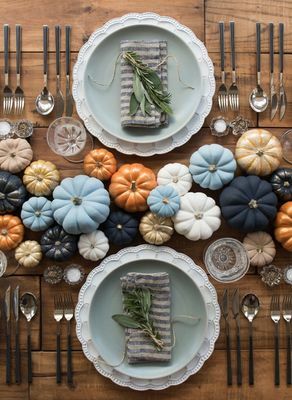 We’re especially loving their chalk paint pumpkin centerpiece!